As in many other sectors, artificial intelligence (AI) technologies are beginning to emerge in the chemical process industries (CPI). While AI-assisted solutions, and other associated technologies, such as robotic process automation (RPA), Internet of Things (IoT), automated drones and quantum computing, are still relatively new for many CPI applications, developers and users alike are realizing their potential benefits for expediting research and development (R&D), predictive maintenance, process optimization and more. Within its Smart Operations initiative, Henkel AG & Co. KGaA (Düsseldorf, Germany; www.henkel.com) is utilizing AI capabilities in its global process operations and supply chain. "We use AI to run efficient analyses of complex data arrays for achieving higher production performance, quick product innovation and scaleup for our self-adjusting production systems," explains Sandeep Sreekumar, global head of Adhesive Digital Operations at Henkel. "Our focus is not only on collecting internal manufacturing data, but also on actively working with customers on data collection opportunities during product usage to make improvements and adjust to changing customer needs," says Sreekumar. Henkel currently applies externally built AI technologies, but the company envisions creating an ecosystem where both internal and third-party solutions co-exist and establishing a fully transparent global supply-chain and operations network that is both automated and self-adjusting to variability, explains Tim Gudszend, global head of Adhesive Technologies and Investment at Henkel. The company's "smart factory" technologies are designed to enhance understanding of raw materials availability and current production status to better advise operations personnel on how to adjust the production process to improve performance. "By analyzing these data, we have implemented significant raw-material yield improvements and increased performance quality within these plants," adds Gudszend. While Henkel has seen success in its AI projects, any implementation of new technologies is not without its challenges. "One of the biggest issues is generating all of the relevant data for a process and its influencing environment, and making this information available for a ‘big data' solution so it can be utilized to its full extent," explains Gudszend, adding that Henkel is deploying enhanced data-analytics platforms to better integrate data across its global supply-chain and operations networks. Even with the challenges, Sreekumar emphasizes that Henkel has realized many AI benefits, from expediting speed to market for new product formulations and scaleup to rapidly detecting and resolving product-quality issues. "AI technologies are disruptive, and will continue to help drive new product launches and improve production rates from months and years to weeks or days. The technologies will encourage the development of new business models, improve operating conditions and generate better-quality products," he continues. In Japan, a new research project has applied AI to significantly expedite polymer design and accelerate the development of advanced functional materials. The work done by Showa Denko K.K. (SDK; Tokyo; www.sdk.co.jp), the National Institute of Advanced Industrial Science and Technology (AIST; Tsukuba City; www.aist.go.jp) and the Research Association of High-Throughput Design and Development for Advanced Functional Materials (ADMAT; Tsukuba City; www.admat.or.jp) has indicated that AI-aided polymer design is about forty times faster than conventional approaches. Beginning with a very large number of candidate polymers, the AI technology can predict polymer properties in less than one second per polymer, according to SDK. Current trials have focused on determining polymers' glass transition temperature from a field of 417 different types of polymer structural data, but the technology could easily be applied to any number of desired properties. In this case, the polymer with the highest glass-transition temperature was determined in just 4.6 trials (Figure 1). 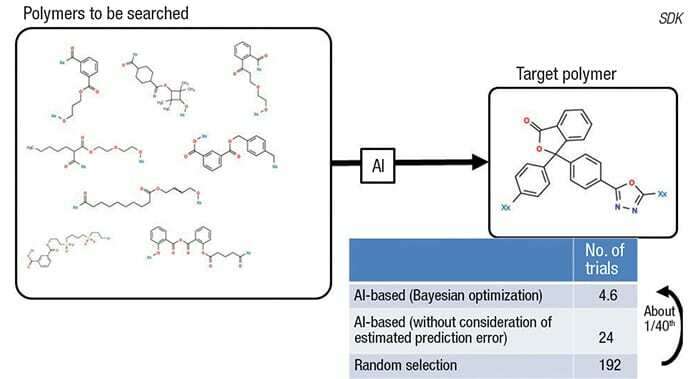 This is not the first application of AI in the polymer-design sphere, but it is set apart by its use of Bayesian optimization, which further accelerates the process. "Usually, AI is not as efficient for polymer design because it tends to recommend similar polymers that have been previously examined. In contrast, Bayesian optimization enables us to survey a larger variety of polymers possessing a desired property by considering the tradeoff between high expected performance and high uncertainty," explains SDK. High uncertainty indicates that the polymer has not been examined in the past, and high performance indicates the polymer's appropriateness for meeting a set of property requirements. SDK believes that the high-speed prediction enabled by AI will provide a competitive advantage in the development of new products by evaluating a massive amount of candidate materials in a short amount of time without the need for manual experimentation. AxiPolymer Inc. (Montreal, Que., Canada; www.axipolymer.com) has developed specialized AI solutions customized for the needs of polymer processors. "Polymer production, as well as polymer processing, have sophisticated interrelated parameters that determine the final polymer properties, and these parameters produce an enormous amount of data. AI provides us the opportunity to find the hidden pattern between these parameters to tailor final products' properties," says AxiPolymer. The company's experience with AI initially began with the development of decision-aid tools designed for implementation into polymer supply-chain processes. Then, based on additional analysis, the team began investigating the equipment failure and predictive maintenance needs of the industry using AI technology. Since AI and machine learning are still relatively new concepts in the polymers industry, AxiPolymer observes that many companies are not aware of how deeply these tools can provide business competitiveness. "The main input for AI algorithms is historical data. In the polymer industry, the amount and variety of unprocessed data is incredibly high. It is clearly a matter of time until these tools become more commonly used to realize the full benefits of these data," explains AxiPolymer. AxiPolymer's R&D team is currently working on a novel, realtime decision-making module to provide AI-based optimization techniques for polymer producers and processors. Considering numerous control factors, such as reactor pressure, temperature and feedrate, as well as the impact of these parameters' variations on other properties, the module will enable users to predict and tailor final product properties without conventional trial-and-error development techniques. Moreover, according to AxiPolymer, the module can provide guidance on necessary changes in the current state of the system based on practical constraints to maintain the target properties of the final product (Figure 2). In another project investigating AI for materials development, a team of researchers from Osaka University (www.osaka-u.ac.jp) applied AI to automate the selection of materials for organic photovoltaic (OPV) solar cells, which consist of an organic component and a semiconducting polymer. The work sought to maximize the power-conversion efficiency (PCE) of OPV cells by determining the optimal combination of organic and polymer materials, a process that typically requires a great deal of time-consuming trial-and-error experimentation. Using AI and machine learning, the team was able to evaluate data from 1,200 different OPV cells to target the optimal set of properties – in this case, band gap, molecular weight and chemical structure – to quickly determine which ones would be most efficient, and then screen polymers for their predicted PCE. The team then evaluated which of these resulting materials could most feasibly be manufactured. This particular work utilized "random forest" machine learning, which creates a network of decision trees for data classification and regression. The promise of AI technologies in the CPI stretches beyond the laboratory – AI is positioned to transform operations through improved maintenance planning and process optimization. In collaboration with SDK, Hitachi Ltd. (Tokyo; www.hitachi.com) has developed and commercialized an AI-assisted predictive-maintenance platform, which will now be offered to Hitachi's manufacturing customers worldwide. SDK's Oita Complex ethylene plant served as the trial facility for demonstrating the commercial practicality of the new AI service, which utilizes adaptive resonance theory (ART) to analyze and classify plant operational data in realtime and identify anomalies that could lead to equipment failure. In trials at the Oita plant, the technology successfully predicted the occurrence of coking. According to Hitachi, this method is able to detect patterns and abnormalities that would not be detected by conventional predictive-maintenance models. Now, SDK plans to roll out the technology into additional plants, while also further refining the AI model for determining different coking mechanisms. In December 2018, Compañía Española de Petróleos S.A.U. 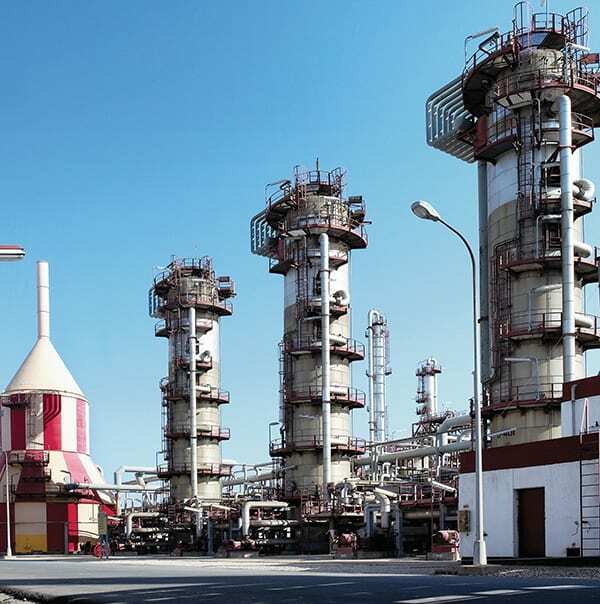 (Cepsa; Madrid, Spain; www.cepsa.com) completed a project to implement AI technologies to improve operations at its phenol production unit at the Palos chemical plant in Huelva, Spain (Figure 3). According to the company, these new AI-enabled measures have increased phenol production by 2.5%, resulting in an additional 5,500 metric tons of annual capacity. To achieve this, two realtime optimization routines were developed that use machine learning and predictive models to provide operational-improvement recommendations to plant personnel at 15-min intervals. Building these optimizers required analysis of over 3,000 process variables, ranging from laboratory data to local climate conditions. In June 2018, Repsol (Madrid, Spain; www.repsol.com) launched a collaboration with Google Cloud to apply AI and advanced data analytics to optimize consumption of energy and other resources at Repsol's 186,000-bbl/d petroleum refinery in Tarragona, Spain. 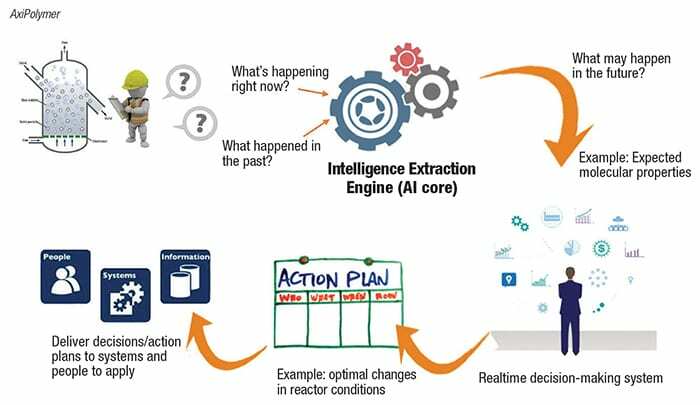 According to Repsol, the project aims to intelligently manage over 300 variables using various AI and machine-learning models, which represents a more than tenfold increase in the number of variables that are typically handled by digitally integrated industrial systems. "Smart" sensors, AI and robotics are increasingly being employed to improve safety and resource efficiency. 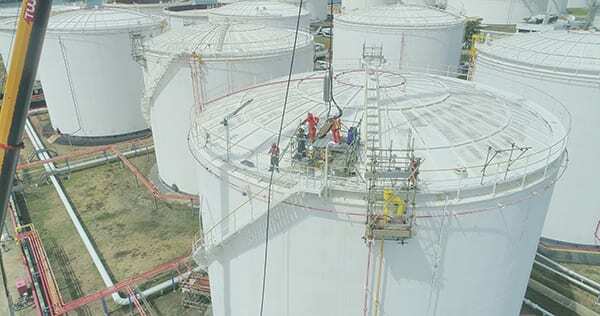 Storage tank and terminal operator Royal Vopak (Rotterdam, the Netherlands; www.vopak.com) is piloting several advanced technologies at its facilities in Singapore, including drones, robots and "intelligent" logistics and planning systems (Figure 4). 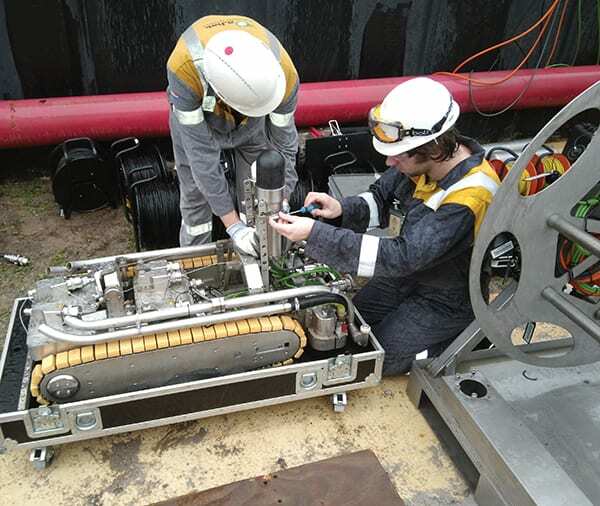 "The use of robots for tank inspections avoids sending staff into confined spaces and minimizes the exposure of personnel to potentially hazardous conditions," says Edwin Ebrahimi, innovation engagement leader for Vopak Terminals Singapore. Furthermore, since tanks do not need to be cleaned and ventilated for in-service robotic inspections, generation of emissions and wastewater is avoided. During these in-service inspections, the tank remains available to customers. In addition to inspection robotics, the team is also evaluating condition monitoring and digitalized supply-chain integration as part of its Singapore innovation drive (Figure 5). "The Singapore terminals function as a testbed for new technology, and after successful trials here, we aim to deploy it throughout our network worldwide," explains Ebrahimi. Beyond analyzing and automating technical processes, the company is also seeing success in digitalizing administrative and logistical activities. "The use of RPA and AI will help us reduce the administrative workload of our logistics and operations departments, so they can focus on value-added tasks for our customers, creating better visibility on their supply chain. Finally, improving terminal productivity will lead to lower operational costs," says Ebrahimi. AI also holds promise to streamline water-treatment operations. Two separate projects from the University of Waterloo (Ont., Canada; www.uwaterloo.ca) are using AI to tackle major water-treatment challenges – leakage and cyanobacteria. Working with industry partners, researchers from the university have developed a sophisticated AI signal-processing platform that uses hydrophone sensors to record acoustic signals to detect even very small leaks in water pipes. In laboratory trials, the sensors successfully detected leaks as small as 17 L/min, and researchers are now conducting field trials of the technology. The ability to quickly and accurately detect signs of leakage enables more proactive response. The presence of cyanobacteria creates a variety of serious problems for water-treatment plants, and monitoring is crucial in mitigating these issues. AI software developed at the University of Waterloo can identify and quantify different varieties of cyanobacteria and provide automatic analysis of water samples in about 1–2 hours – considerably faster than traditional manual-analysis techniques that may require 1–2 days to complete. The quick analysis turnover can provide operators early warning of potential issues. The team's goal is to evolve the AI software into a microscopic continuous-monitoring solution to handle additional microorganisms and other contaminants beyond cyanobacteria. Last month at the 2019 Consumer Electronics Show (CES) in Las Vegas, Nev., ExxonMobil Corp. (Irving, Tex. ; www.exxonmobil.com) and IBM Q (www.ibm.com/ibmq), IBM's industry-first initiative focused on accelerating quantum technologies, announced a new partnership that will bring quantum computing capabilities into the energy sector for the first time. Quantum computing – an emerging technology with immense computational power – holds promise to tackle extremely complex scientific challenges more effectively than conventional computers. For ExxonMobil, potential applications of quantum computing include predictive environmental modeling and discovery of new materials for more efficient carbon capture. While advanced technologies like quantum computing are still very new to the CPI, new applications will certainly continue to arise as more users begin to understand the capabilities of AI.